Big Band Swing music really developed during the roaring 20’s from New Orleans Dixieland and Ragtime. Trumpet and coronet player King Oliver had one of the hot bands playing in New Orleans and later New York. The young Louis Armstrong was in this band in the early 20’s just before joining Fletcher Henderson. Louis Armstrong was an innovator besides working with bands and bandleaders that were innovators themselves. lot of the real ground work for what came to be big band swing music took place. arranger for his own band. … The King Oliver example is a much smaller band and the instruments are going off on their own direction as soloists; one trumpet, one clarinet, and one trombone. ... example #2 sounds to be a later recording and we can hear it's getting further away from the New Orleans sound and closer to the big band swing sound we usually identify with... and saxophones instead of clarinet... Yaayyy! The hot stop in Harlem was the Savoy Ballroom were everyone wanted to play and everyone wanted to dance. The Cotton Club had Duke Ellington as the house band from the late 20’s and he was crafting his own big band there writing and arranging and stretching this new musical landscape. At this time the Cotton Club was different from the Savoy because it was a show room for whites being entertained primarily by black musicians and dancers. The Savoy was primarily for blacks. 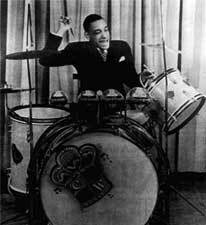 Chick Webb was the first drummer to lead a big band and by doing so paved the way for Gene Krupa, Buddy Rich, and Louie Bellson, all of whom were blown away by Webb during the “battle of the bands” that were regular events at the Savoy Ballroom. lived for 30 years due to tuberculosis of the spine. just have a drink and check out the “King”. Through the 30’s the list of musicians that frequented the club is a who’s who of the swing era; Duke Ellington, Count Basie, Cab Calloway, Benny Goodman, Buddy Rich, Gene Krupa… just imagine being there! The standards and templates had been set right there at the Savoy; Fletcher Henderson with the musical arrangements and Chick Webb with the musical talent that set the performance level. There seems to be a similar comparison in the way rock and roll came about to the masses in the mid 50’s even though it was alive and well since the late 40’s…. Big band swing, created by primarily by blacks in the 20’s then a decade later Benny Goodman is called “king of swing”. Rock and roll is created primarily by blacks in the 40’s then a decade later Elvis Presley is called “king of rock and roll”… weird stuff. Both Presley and Goodman played a very important role in bringing the most popular music of their time to the masses; Goodman was a hard working band leader and one of the best clarinetist of his day and Elvis had a great voice and stage presence but neither were musical innovators. The Big Band Swing era ended many years ago but there are a lot of them still around today. Tribute bands, neo big band swing groups, college big bands, Brian Setzer Orchestra. etc. The big band swing sound is here to stay because it's so cool!